Conventional mode of Drying Textiles after they have been dyed is a slow process. Textile industries can increase Throughput and fill orders more prominently using Radio Frequency (RF) Dryers. RF system has capability to accelerate the drying process and shorten production time. RF drying offers High Volume, High speed and High quality drying which is what exactly needed in textile industries. As wet garments of Acrylic, Cotton, Nylon and Polyester Blends pass through the drying chamber , the radio waves vibrates the contained Water molecules million times per second, vaporizing them. Ventilator Fans are used to remove damp air from the Drying Chamber. The dryer system comprises the 125kW industrial high frequency generator in conjunction with a drying chamber incorporating an electrode applicator and air extraction system. 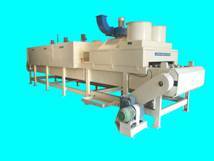 The equipment is suitable for drying most types of fibers which have had prior mechanical moisture extraction in either, cone and muff, bump or loose stock form. Many types of fiber can be dried. The machine incorporates a modular polypropylene conveyor band and conveyor system. Because of the RF waves concentrate in the wettest, densest portion of the garments. RF drying has a leveling effect that practically eliminates any problems of uneven shrinkage and over drying. The RF drying times depend on the type of fabric, the percentage of moisture in the fabric going in to the dryer, and the degree of dryness desired. Energy applied by radio waves at a frequency of 40.68 MHz. Volumetric heating keeps the temperature low and uniform throughout the web to prevent overheating. Radio frequency drying is often used to dry crackers, cookies, and other snack foods after they've been baked. It can also be used to dry ceramics, synthetic foam, textiles, water-based inks and adhesives in paper products, and fiberglass yarn. Other applications include sterilizing bagged materials and preheating thermoset plastic molding compounds. Drying municipal sludge and timber is being investigated.